I sat down to write about creativity but will begin with race. I’ll get to creativity later. All people are basically the same. Even so, likes prefer likes. Whether acknowledged or not, every group thinks it is better than the other. I’m told that, historically, each tribe of Native Americans referred to themselves as “the human beings” or “the people,” while the names they gave other tribes were epithets describing creatures who were less than human. That’s us! Is it not? Dividing us by race and setting us against each other seems like a cruel thing for the Creator to do, but I guess there was a reason for it. Giving us the capacity to enslave others, however, is too harsh to even remotely understand. That capacity is what rightfully gives racial issues their hypersensitivity. I can wish everyone wasn’t so sensitive, but there is too much working against it. While smart people don’t discuss race, I have to admire those who do. One is Bob Huber, a writer for Philadelphia Magazine. 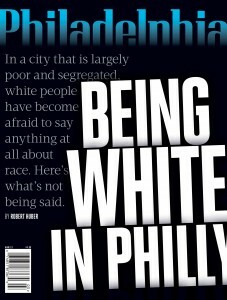 In the March edition of the magazine, he wrote a piece called, “Being White in Philly.” In it he tells stories of race from a white perspective. After Huber’s article, many did. This was his intention. There were a number of public forums around town and the online version of the article – as of March 25 – had 6,292 comments. The article, among other things, mentions how whites, upon entering a local convenience store, hold open the door longer for blacks than for whites in order not to offend them. Later, Huber quotes a Russian woman who thinks blacks do nothing but sit on their front porches smoking marijuana. It’s that kind of material. I think it is good to know how people feel. I want to know how people feel about me, even when they don’t like me. My natural assumption is many will not like me, or at least think I am less that I am, certainly less than they are. In the extreme, this may anger me, but I can live with it. I understand that others may not, cannot and will not. But that’s not why I’m writing. I’m writing about creativity. Mainly, I want to know if one race is more apt to be creative than another – specifically whether minorities are more willing and more capable than the majority in advancing art. In the past I’ve had thoughts on this. They resurfaced recently when I heard a radio interview with a black record producer. By his own admission, this producer is not your normal black record producer. In order to set up a story about his style of producing, he told the show’s host that black artists create something then quickly leave it behind to create the next thing. White people, he said, go back and revisit what already has been created. Twist aside, I saw truth in his stereotype, especially in the progress of music. 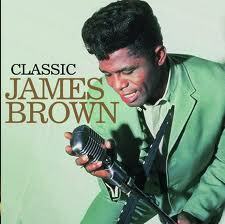 By the time white bands, for example, took up the blues, black artists had left it way behind. Shortly after this interview, PBS aired an American Masters episode called, “The Blues Brothers Band Remembers Cab Calloway.” The Blues Brothers movie, of course, clearly depicts the tendency for whites to revisit the old. 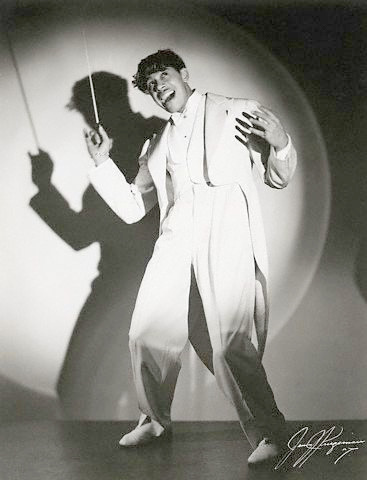 More interesting was a specific story in the documentary about the legendary Cab Calloway. He could not comprehend why anyone would want to put a near ancient rendition into a contemporary movie. Landis eventually talked him into it, but it was completely foreign to Calloway. One of the shockingly bad things about art in any form is that it so often is a copy of something done by an innovator. I believe it was Paul Gauguin (not a minority but definitely off the path) who suggested that there are only two kinds of artists: plagiarists and revolutionaries. It could be said that the plagiarists have a stake in the status quo while the revolutionaries want to destroy it. Could this be the case with the white-black creative dichotomy described by the record producer and illustrated by Cab Calloway? While few want to discuss race, I’d like to hear from people on this. Let’s forget about Philly Mag and the suppressed hostilities of whites for a while and talk about whether muses favor those who have been pushed outside the mainstream. What drives a person to originality and risk when so many others are content to stay stuck on what’s popular? Is white innovation a rarity? Surely there are white revolutionaries. In a pinch I could name 10. (Pollock yes; Presley no.) Do white innovators have to try harder, or must they – unlike blacks – possess a genetic mutation or be social misfits? I can’t speak first hand to this. I’m hoping others can. Please write. Over the years, the things we were forced to read in high school have gotten better. It was punishing to read great literature at a young age. Personally, I was not only incapable of appreciating it; I didn’t want to appreciate it. Aside from things like “Catcher in the Rye” and maybe those THE FUTURE IS GOING TO BE TOTALITARIAN books, there was no desire to spend time with genius writers. The time was for living; not so much for reading. After the edge is worn off life experiences, literature has more of a place. Yes, you can jump out of an airplane if that’s your idea of excitement, but it’s not like going to a Friday night football game and expecting a fight; it’s not like kissing a girl that you cannot stop thinking about; it doesn’t compare to that first road trip with five guys in a rusty car and a total of $100 between you. Certainly none of this can compete with Melville or Ezra Pound. Those two can’t even compete with the understated magic of hanging around a parking lot complaining that there is nothing to do – but hoping that soon there will be. Those anticipatory adrenalin rushes fade for reasons both physical and metaphysical. When they are gone, great books becomes much sweeter. Someone recently discarded an anthology of American Literature. I picked it up. The book is filled with writers rarely read outside of classrooms but there are in there because they are brilliant. I reviewed the preface to Walt Whitman; learned how much time he spent on “Leaves of Grass,” basically rewriting it his entire life; thought he was just a human and that the person describing him was over stating his case. Then I read Whitman, putting him in the context of his time (meaning no one ever wrote like this before), and quickly realized how deserving he is of the place he holds. 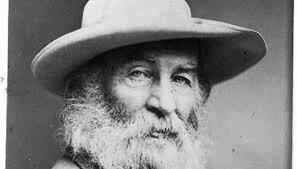 I remember from high school that Whitman was considered the ultimate optimist, the lover of everything. He would not allow bleakness and atrocity to wither his spirit. But they are not the Me myself. To Whitman, there is no death . . . as mortals understand it. Would I seem ridiculous if I gushed: This kind of stuff goes on and on for page after page after page. The enormity of it overwhelmed me. Whitman’s ability to sustain his pace and prophetic message mystified me. My advice then: A retreat to the refuge of beauty and truth, even if they are under appreciated, is recommended when you can no longer find the Heart of Saturday Night. He questioned softly, “Why I failed”? Because movies rely so heavily on visuals, film producers and directors are good at describing complex concepts with just a few words. I read such a description in a book review by Susan Balee in the Philadelphia Inquirer. It comes from film producer Michael Deane, who was trying to explain the importance of car crashes in movies. 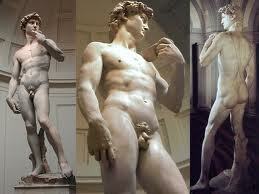 A thousand people drive past the statue of David. Two hundred look. A thousand people drive past a car wreck. A thousand look. Does a genius steal, borrow or reinvent? Good artists borrow; great artists steal. – attributed to Pablo Picasso. Art is either plagiarism or revolution – attributed to Paul Gauguin. I just left the Philadelphia Art Museum and a show entitled “Visions of Arcadia.” It features work by Gauguin, Cezanne, Matisse and others. In that show I saw plagiarism, thievery, revolution … and genius. “Visions of Arcadia” is designed around a theme rather than a style or period. The theme is the classical idyllic life associated with ancient Greece and the region known as Arcadia. Even though the ancient Greeks seemed to be constantly at war, there is this myth of Arcadia as a land of simplicity, peace, virtue and the sensual pleasures of nature, wine and women. The Roman poet Virgil, who wrote in the first century B.C., romanticized Arcadia in his work “Eclogues.” European artists became fascinated with his concept of Arcadia and sought to paint it, with some scenes taken directly from Virgil’s words. Most are of either bathers or people in the woods having lots of fun. Many of the paintings are from the late 19th and early 20th centuries. In the museum’s commentary, it is suggested that the artists found inspiration in a 17th century work by Nicolas Poussin, which hung in the Louvre. Admiring artists would visit the Louvre to study and copy the Poussin, then base their own work on it. 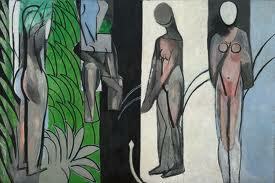 Their derivatives inspired other artists, resulting in a whole lot of bathers being put on a whole lot of canvas. Some were sinfully like those that came before. How many great literary works have taken titles from other great works? For Whom the Bell Tolls, The Grapes of Wrath, Song of Solomon, Inherit the Wind, Stranger in a Strange Land. In Faulkner’s Absalom, Absalom! an entire biblical story is retold. In all artist efforts, there seems to be this unstoppable tendency for the great to hover around the great, to want to become kin, to show understanding of the legacy, to build on it and improve it. Which is not really stealing. It is more like worshiping a god in hope of becoming one. “Visions of Arcadia” does, however, make one wonder why so many artists insisted on painting and repainting bathers. Touring the show, the viewer learns that many of these artists worked together, socialized together, philosophized together. Although egos often were huge, you can sense that the artists acted like a cultural community, with a single purpose; or that they even were a single entity with a single mission. That mission started as plagiarism but ended as revolution. That becomes obvious as you move past the Renaissance style paintings, through Impressionism and Pointillism and on to one of the last – a cubist rendition of bathers. When you learn that the artists we idolize today were mostly outcasts whose work was considered unacceptable trash (sometimes called “fauve” or savage), you realize they could hardly be considered copyists. If you are nearby, go see “Visions of Arcadia” at the Philadelphia Art Museum. Perhaps your reaction will be far from mine. I’m betting it will be. No words in this trailer, but the movie — Guzaarish — is an example of mixed language. Watch it on Netflix. I like language, its power, its beauty and its imperfections. Learning about a language can tell you a lot about the people who speak it. Chinese, for example, is structured in a way that allows the speaker to say something without really saying it. It is a subtle and metaphorical tongue. This is due in part to the fact that many, many words share the same pronunciation, like the English “dear” and “deer” but on a much wider scale. The given name of deceased Chinese leader Deng Xiao Ping, for example, sounds just like the words “little bottle.” When the Chinese people tried to convince the Communist government to install Deng as their leader, they marched through the streets holding up little bottles. This allowed them to make a point while denying they were engaged in political activity. In India, they do something even cooler, something I find fascinating but don’t understand. I hope someone can explain it to me. I haven’t been to India and know nothing of Hindi, the official language, but I do watch Indian movies. In those movies people will be speaking a blue streak of Hindi – to a friend, to a lover, to a business acquaintance or government official – then without warning or pause switch to English. Then just as quickly, they will switch back to Hindi, then do it again and again. Ten words of Hindi, five of English, 100 of Hindi, three of English … on and on. I’ve tried to figure out if certain things are said in English for effect or emphasis, but it doesn’t appear that way. It appears random – totally random, without reason. But it can’t be. Or can it? Who out there can explain? The few Iranians I’ve known I’ve liked. But they pre-date the ayatollah. Curious about what people and life are like in today’s Iran, I went to see “A Separation,” an Iranian movie that won the Oscar for best foreign film. The women cover their heads. All buildings are in need of interior and exterior paint jobs. In court there are no lawyers. Aside from those differences, people and life are the same as in the U.S.
Husbands and wives fight. People lie and cheat. Cities are busy and crowded. There are strong women able to fix problems caused by men. There is traffic. Girls go to school. Children are valued. The unfortunate find themselves out of work and out of money. There is an attempt to see that justice prevails. I was looking for strong evidence of Islam. Little was found, even in court. Court mainly consisted of all parties yelling and screaming and a judge (in street clothes) trying to rule without the aid of procedure. Some people, like in America, were more devout that others. A woman hired to take care of an Alzheimer’s patient telephoned a spiritual advisor to ask if it was OK to change the man’s soiled paints. Others didn’t seem so devout and would swear in front of women and children. Someone was accused of stealing money but there was no attempt to cut off her hand. In the end, a couple divorces and a child is forced to choose which parent to live with. Iran could easily have been Brooklyn. One thing I also should mention: Those Iranians can act. “A Separation” was a simple yet worthy film, well executed in a shockingly realistic style. You don’t even think you are watching actors.